Midland, Mich. -- Republican U.S. Senate candidate Gary Glenn received word by mail Saturday that his candidacy has been endorsed by Right to Life of Michigan. “Even liberal legal scholars have recognized that Roe v. Wade is the result a radical legal agenda with no basis in the U.S. Constitution. We must defend the God-given right of every prenatal child to take its first breath and appoint to our judiciary only those who will defend and uphold what the Declaration of Independence identified as the first right with which we are all endowed by our Creator,” Glenn said. 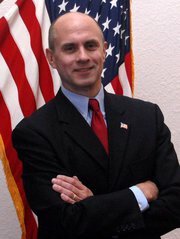 In 2006, Glenn was a leading proponent of the Prenatal Child Protection Amendment to the state constitution, which would have simply defined a prenatal child as a person from the point of conception and thus included under constitutional protections of all persons against loss of life, liberty, or property without due process of law. The amendment failed to gather enough signatures to appear on the state ballot. However, Glenn’s campaign website indicates that if elected, he will sponsor such an amendment to the U.S. Constitution. In February, Glenn won the endorsement of the Michigan 4 Conservative Senate statewide TEA Party, a coalition that has now grown to nearly 50 local TEA Party organizations across the state. He has also been endorsed by former Arkansas governor, presidential candidate and current Fox News host Mike Huckabee, and the National Right to Work and the Term Limits America PACs. Glenn has a 33-year history of fighting for the cause of limited government and conservative values. As executive director of the Idaho Freedom to Work committee, Glenn drove the successful effort to pass Right to Work legislation in that state in 1986, prohibiting compulsory union membership or financial support. He is a founding member of Michigan Freedom to Work coalition, which is pushing for passage of such a law in Michigan. Glenn is also one of two coauthors of Michigan’s Marriage Protection Amendment defining marriage as only between one man and one woman.